Last week, the fantastic new Nike Miami store opened its doors on the Lincoln Road Mall with a dazzling two-story, 31,000-square-foot athletic fashion gem. I was lucky enough to be able to attend the Nike Miami Grand Opening event and get a first look at the brand’s limited-edition swag and state-of-the-art shopping perks. The visual impact of the store is significant, being just as impressive from the outside that it is on the inside. The stunning exterior uses waffle ironing in concrete and terrazzo panels, echoing South American and South Florida design. The interior showcases a multimedia installation by Miami artist Jessy Nite, combining the forces of painting, typography, and sculpture. The basketball and soccer fanatics out there will particularly love the most cutting-edge Nike+ Trial Zones. As a shopper, this means that you will not only do you get to try on products, but now you also get to try them out! You can get a feel for your potential new shoes on the 285-square-foot basketball court or score a gooooooool on the synthetic turf soccer field. For the runners, you can even get a personalized running experience on a camera-operating treadmill. How cool is that? During the opening event, I was able to watch as the treadmill was recording strides and knee performance that was then downloaded to ensure a customized consultation for sneakers. While that all might sound nice, you really need to see it to believe it! Luckily, YustisFutbol published this review of the store which showcases some of those impressive features we mentioned – specifically the Trial Zones! 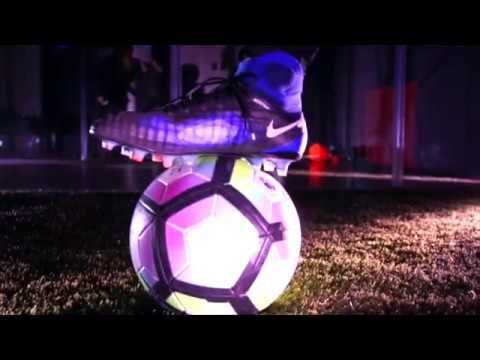 Soccer players out there will really love this video since he gives a brief review of the boots he was able to try out in the store. As a Miami local, we are really looking forward to the events and releases we will now have access to with such an important Nike store in town. This can only mean good things for the Nike fans in the 305! So what do you think? Will you be adding the new Nike Miami store on your to-do list next time you are in Miami Beach? Let us know in the comment section below. Thanks again to Nike for inviting us to the Nike Miami Grand Opening event!